As most of you know, I'm very limited in what kinds of exercise I can do... thank you very much dysfuntional knee and most recently, shoulder. Bascially I can walk or use an elliptical machine - BORING! Until now. This country is made for walking! Lace up your sneaks and put on your best moisture-wicking fabric and hit the sidewalk! Important tip - go early. By now I do not have to remind you of the heat. You can walk ANYWHERE in Singapore. There are sidewalks on all streets, even the busiest ones. I usually go one of two ways: to the Botanic Gardens or toward Holland Village. The Botanic Gardens are a mere ten-minute walk from my apartment, with pure jungle on my left the entire walk (busy road to the right). In fact, the Sultan of Malaysia had a palace on that land, that was just left to deteriorate. Oh I wish, how I wish, I could get back there to check it out, but instead I resort to pictures found on the internet. If you have a minute, it's completely fascinating. 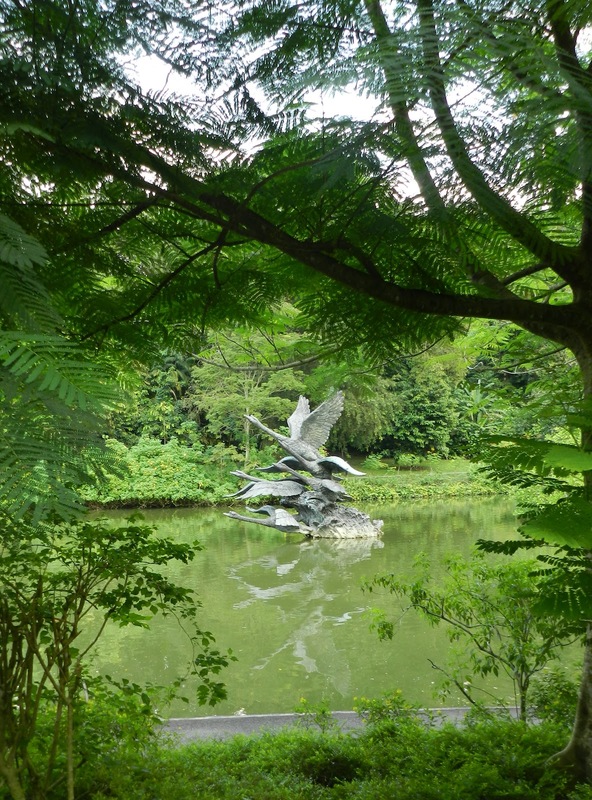 So let's take a quick look at the Singapore Botanic Gardens. 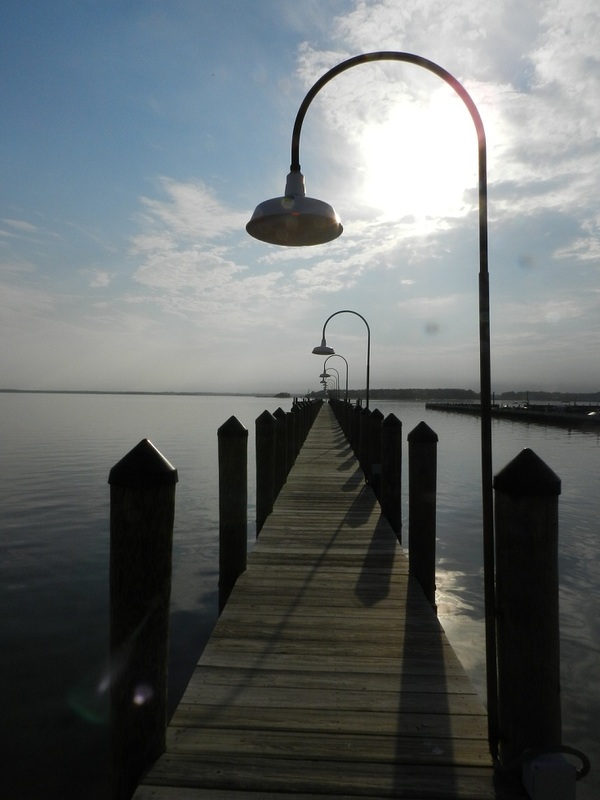 It's a 183-acre government-owned park, about 1.6 miles from end to end. It is open from 5am until midnight every day and has no admission charge (except to the National Orchid Garden located within the gardens). It also has rainforest trails, making it only one of two cities (with Rio de Janeiro) to house a tropical rainforest in the city limits. I have not entered the rainforest trails because I am a baby and am afraid of snakes. Big, big, baby. I wouldn't consider a ground floor apartment because of possible snake issues. It's bad. Also, the two people Jason has asked about snakes have admitted they've had encounters. So at least I kind of have a reason. So this is what you will see early in the morning at the gardens - Tai Chi. Tai Chi is a form of martial arts consisting of slow movements that are purported to help bring about a state of mental calm and clarity. It must work, or a whole lot of people have been completely brainwashed. I'm going to resist the urge to make fun of the Tai Chi'ers, but cannot help but make fun of the people who do some form of asian line dancing sometimes. Now that's funny stuff. Total side note: this is totally stereotyping, but in a good way. Asian people are funny. They generally have a really great sense of humor, and I love it. They are always taking the touristy photos where they appear to be holding up a statue or pretend the water from the fountain is coming out of their mouth etc. Today I watched a group of girls try (over and over) to get a picture of themselves jumping in the air at the same time. When in social settings, there is generally a lot of laughter at the table. I know, I know, I'm talking about an entire race of people so I must be really obtuse. But if you can get the overall message here, thank you. If anyone gets mad at me for calling people fun and thin, so be it. Back to the walk. The gardens are beautiful and I will let the pictures speak for themselves. 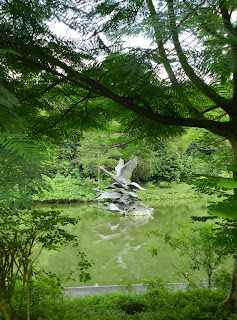 It is so comforting to know that in a big city, I'm so close to this tranquil setting. We took the kids last week and they really enjoyed feeding the fish and turtles, and swinging on the vines. I'm sure Sophia will force me into the rainforest next time. Look out snakes, here I come!! Turn right out of my apartment complex and I've got a 10-minute walk to Holland Village, our small town within the city that we frequent almost daily. I'm attaching some pictures from my walk on surrounding roads just to give you a glimpse of area scenery. You will notice the construction - it is a constant in this country. Buildings are on average usually no older than ten years old. Once they reach that "old age", they are torn down and new ones are put up in their place. The brutal humidity just wreaks havoc on everything here (at times my mood included), and mold is a problem. Our building is a *very* rare 30 years old, and going strong! This walk is not quite as scenic, well... that is once you grow accustomed to palm trees on your daily route! I walk by several bus stops, a wet market/hawker center (food court and farmer's market), and eventually wind my way into town to get a cup of coffee (at the Coffee Bean & Tea Leaf or the Starbucks, it's really not that different than the US). Word of caution, WAIT for the green man when crossing the street. Oh my goodness, I got sick of waiting and almost forgot the direction of the traffic (they drive on the opposite side of the road). Lesson learned and won't do that again. Here are a couple of pictures on my route. I walk on the main road, then turn off on side streets, just for variety. One annoying thing....people here are generally very friendly...but they don't seem to move to the side when passing you on the sidewalk. It's frustrating, I always move over, even when I'm forced into the grass! I can't understand it, but I guess I will just have to be more assertive! Lastly, about a week ago, I took my walk at night (big plus is the relative safety of Singapore, you can walk around at any time) and was strolling by the nearest hospital, when I spotted a pretty good-sized wild animal bounding into the bushes. I estimate it was about 40 pounds, black or dark brown and had a long and thick tail. Because it was running away from me I couldn't see it's face, and I have no idea what it was. Hope you had a good experience at the hospital, mystery jungle animal! So there you have it, my morning routine. Which of course always ends with a shower. Which is pointless....I will need another in two hours. 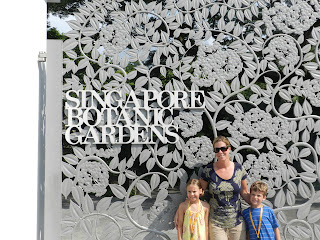 Next time - our first trip to Sentosa Island! 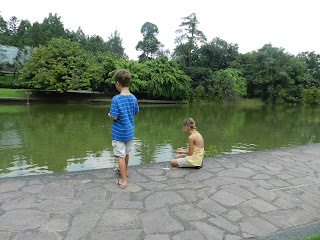 We've been here for two weeks, and have already been to the Singapore Zoo twice. In 2011, it topped the list of Conde Nast Traveller's best zoos in the world, and it truly deserves the honor. The zoo is an absolute marvel of planning and design. There are really very few areas that require you to walk in the sun for more than a couple of minutes. The landscaping is lush, scenic and the exhibits integrated effortlessly. There is a tram that you can pay one fee to ride all day, which is worth it if you have young children and no stroller. ( Strollers can also be rented). But it's quite a hike from the front of the zoo to the back (where the children's area is located), so even adults will enjoy the break! When you enter the gates, you are greeted by a tree with free-ranging (a huge theme here) tiny little monkeys. They're just having a grand old time, swinging around and chasing each other. It's the perfect introduction and really sets the tone for the zoo. The shows are also very well done. There are three main shows - "Rainforest Fights Back", "Splash Safari" and the "Animal Friends Show". They are your usual comedy/animal tricks shows. My kids adored them all, and were able to take part in two of the three the first time we attended them. They are the perfect length - no more than 30 minutes....not sure about you, but I can't stand when these things drag on forever! There is also the Asian Elephants Show, which is located at the elephant habitat (in contrast to the other shows being located in amphitheatres). It is short but wonderful, and really showcases the talents of these huge animals. Get there early to get the seats in the shade! After the show, you can pay S$5 to get a basket of bananas, apples and carrots to feed the elephants up-close. In fact, most of the animals had feeding options (for a nominal fee of course). I fed a giraffe at the (also amazing) Tampa Zoo and honestly it was my favorite part of the day. I can't wait to go do it at the Singapore Zoo! There are also elephant rides! We couldn't do everything in one trip, and I've already promised the kids a third trip back next week. Thank goodness for the inexpensive family pass! Lastly, this zoo has a water park area for the kids (and adult kids). Just when you think you can't take the heat another minute, just find a spot in the shade and send the kids away to cool off on the water slide, get drenched by the big water bucket or play in the many large sprinkler areas. For special occasions, you can "lunch with the lions" or have "breakfast with the monkeys", and adjacent to the zoo is the Night Safari. That's next on our list....you go at night and under artificial moonlight observe the activites of the animals. 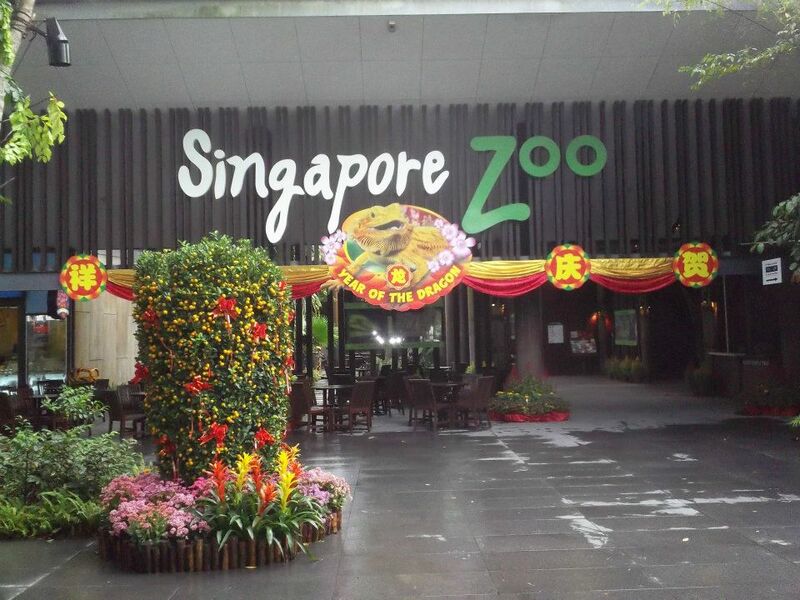 In addition, the zoo system boasts the Jurong Bird Park. Look for posts on all of these in the future! 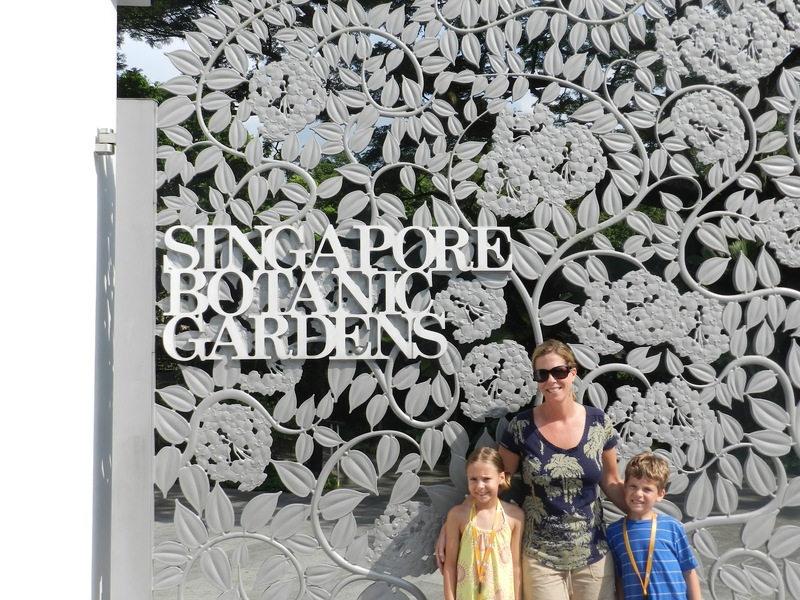 This weekend - last minute overnight trip with another family to Sentosa Island (Singapore) for a night at the Shangri-La Resort, then next weekend heading to Bali...stay tuned! Still loving it here - miss you all though! Live-in help? No thank you. This post is bound to be controversial, and I am totally prepared for it. So as a HUGE DISCLAIMER, I'm going to start by saying that I, in no way, judge the millions of people in Singapore that have live-in help. The problem is that I just cannot understand many things about it, and it is something that I am completely uncomfortable with. Although I am told by everyone, including my hair stylist and the man who supervised the unloading of my container, that I will change my mind, I know myself enough to know that it's just not going to happen. Here is why. It's not just expatriates who utilize "helpers" here (also known as "maids"), it's most of the Singapore population. These helpers are usually young, but not always, and come from neighboring countries such as Indonesia, Thailand or the Philippines. They generally work six days a week, from early morning until bedtime, and are responsible (of course this varies) for all housekeeping, cooking, car washing and child minding, and sometimes grocery shopping and other errands. They live in very small "rooms" of the apartments, it's even common for them to be expected to sleep on the floor in a corner of a room (that's more with the Singaporean population). When looking for apartments, for example, ours would be advertised as a 3+1, meaning three bedrooms plus one for the helper. Not that it could ever be considered a bedroom. Ours is outside and we use it as a closet. The bathroom next to it is about the size of a powder room, it has a shower attachment but no separate shower area. We viewed an apartment that was still occupied and the helper room was just big enough to fit a twin bed with about two feet remaining. Her clothes almost hung over her bed because there was nowhere else for them to go. If you have a helper, you are responsible for their health care (which is very inexpensive in Singapore), their basic toiletries, feeding them and one trip home per year. Let's just say from what I know, the feeding part is very basic. Again this varies by family of course. Before I continue, here's the shocker. The average salary for a helper is about $400. A MONTH. Some do not even get a day off. I know someone who had a helper and got so used to it, that on her day off they used paper plates because they didn't want to wash dishes (dishwasher?). How does that happen? But here is my biggest problem with it, besides the incomprehensible salary. When I interact with a helper, I cannot bear the way they act as they think they are "less" than me. When I am approaching the gate to my complex, which can fit one person through at a time, and a helper will stand and wait for me to go through first, I cringe. I am no better than she is. When I see a young couple crossing the street with one stroller and TWO helpers in tow, I want to cry. When I am in line at the drugstore and the woman in front of me pays, gets her bag, and in the same breath hands it to her helper (who materialized out of nowhere I might add), I feel a little sick inside. The flip side of the coin is that these girls/woman need work. To them, this is a decent amount of money, most of which is sent back home to their families (many times, young children they have left in the care of family members). Maybe it would be helping *them* if I employed one and I am just narrow-minded. But for someone who has never had someone even clean her house, I can't imagine for the life of me what I would do with my time if I had a helper. I want to cook my own meals. My kids will be in school all day. What the hell would I do with my time? Not to mention I'm just uncomfortable with having a "stranger" living in my house, even though they are expected to retire to their room when not needed (how can I even type this stuff?). There is one reason I can understand hiring a helper. If you've moved to this country, and you have babies or toddlers. It is very difficult to find childcare because of the prevalence of helpers, and it's very expensive. In fact, it's just as expensive to have someone clean your house once a week as it is to house a full-time helper. Crazy, right? Again, it may sound otherwise, but just because I have made a personal decision to live as a family of 4, not 4+1, doesn't mean I think you are bad if you 've chosen differently. I just can't wrap my head around it, and choose to stay in my comfort zone. Which is cleaning my own toilets and not having as many impromptu nights out with friends. I can deal with that. And if someday I have to print a retraction and you all get to make fun of me, than so be it. This is how I feel right now. End note: When Cooper and Sophia had sleepovers last Friday night, one of which was at a house with a helper and we went out with the parents, it was really nice. I seriously wanted to pay their helper, which is not allowed. But the irony is not lost on me. I enjoyed the convenience and I cannot deny it. But I'm in hot pursuit of teenagers in my condo complex so I can have babysitters. Hope they're out there! 19,066 miles in 10 days - Couldn't Be Happier! 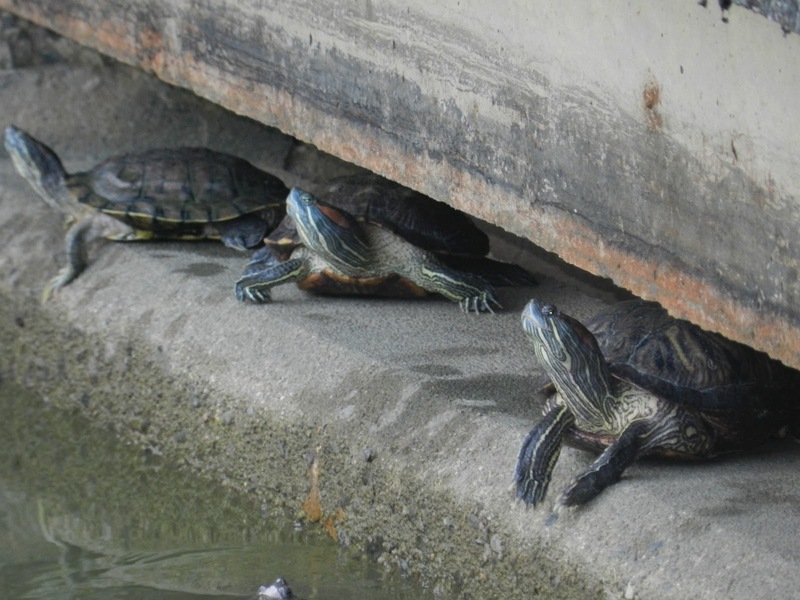 Jennifer has shared the latest news on zoo visits, the family's travels about town, etc. 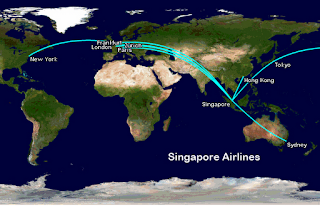 - so I thought I'd share my perspective on my 19,000 mile roundtrip journey to the US, and the return here to Singapore. Thinking back to the days before I left Singapore in late April, I was.....well, let's face it..... I was in Manila, wearing a Hard Rock Cafe t-shirt, enjoying margaritas and posing for pictures with a Mocha Girl...... No, seriously, I was more then ready to get back "home" to see family, friends, and start the adventure in Singapore together, as a family. The last few days of April actually flew by. I fully expected to be counting down every minute to board the plane, but the truth is that work, preparing things at the condo, and packing really made the time go by quickly. The flight itself, likewise seemed to go by pretty quickly. I had wisely rationed movie viewing so I had several options for the flight. Fight Club, Chronicle, and Hot Fuzz ate up a whopping 6 of the 22 hours on board the plane. A couple glasses of red wine and an Advil PM took care of the rest .....I think I've finally got this long-haul thing figured out! Landing at JFK was dreadful. As much as I wanted to be "home", that airport might as well be in a third world country and I was quickly reminded of the lackadaisical, rude, 'don't bother me' attitude of the American service industry. Perhaps that will become a charming reminder of "home" after 2-3 years abroad, but on April 26, after 24 hours of travel, trying to shake off my Advil PM, it was far from cute. The drive from JFK to Greenville, DE didn't help a lot either, but needless to say, my attitude changed drastically when Jennifer helped me surprise the kids and I walked into the apartment unexpected. It will make me cry if I talk about that much - so let's move on. Though I was extremely tired, the next several days, seeing so many of you (friends and family) was great. I was very grateful that family members - both Jennifer's and mine - were able to get together. Ironically, we'll all probably communicate more often via Skype being on opposite sides of the planet then we did when we were only a town away. I also enjoyed shooting a round of 79 at Kennett Country Club (granted - I scored a birdie 2 on a temporary par 3, where the tee box was under repair on a par four). Call it an 81, I was still very happy with my round of golf. It was also a little odd driving up Garden Drive to visit the Patterson and Prestianne families - and just looking, not driving, down the driveway at 721. Jennifer and I were, however, welcomed by the new owners to see all the renovations they've done at our old home. Hardwood floors upstairs and down, new flooring in the basement, and modern, "New Yorkish" furniture sure made it look different then when I last saw it. All the same, it was kind of nice to say one last "goodbye" to a home that gave us so many good memories. We did sneak in a couple days at the beach, and lucked out with good weather for bike rides, miniature golf, Fisher's popcorn, a few hours on the beach, crabbing (caught 3 babies), lunch at the Lobster Shanty, and a drink on the deck at the Rusty Rudder......in other words, we did just about everything we wanted to do before we left what is now our "permanent residence" in Fenwick Island, DE. So now, we're "home" in Singapore. Two months ago, I found myself constantly referring to Pennsylvania and Delaware as "home" - often with work colleagues giving me confused glances. I've slowly become used to referring to both as "back in the US" - and referring to Singapore as "home" - especially now with Jennifer and the kids along with me. Our furniture is due for delivery in less than 24 hours....which is about half as long as I expect it will take the delivery crew to haul everything up the to the third floor to our place in the 150 degree, 100% humidity. True to our normal way of making decisions, the new curtains and blinds were installed on Friday and the painter is coming on Wednesday to paint every inch of the condo. By next Friday, I'm sure it will truly feel like home here at 8A Taman Nakhoda ...... just in time for me to board a flight to Mumbai! This is the first installment of a new series called "Where in the world is Jon's pen?" Our great friend, Jon Wingerd, left his favorite pen (a college graduation present) in our Scattegories game on our last Outer Banks vacation together. I found it right before we left but forgot to give it to him, and realized I had it in my purse when I got here. Soooo.....today Jon's pen just happened to be riding the MRT (subway) from the Labrador Park to the Harbourfront stations. Ha! I'm so funny. Well folks, we've been here for a little over a week, and everything is still going as smoothly as you could hope for. The kids have found friends (so have the adults!) and I have almost mastered the public transportation system. I have to admit, this was one of the things that made me nervous about coming here. The thought of taking buses and taxis to do things like grocery shopping just didn't sound appealing. Turns out, it's pretty darn easy! So today's post will focus on how we get around this island...sorry it's not a more interesting subject! But's a huge part of our lives here, so it deserves attention. By far, we take buses the most. Right outside our complex is a bus stop if I want to go in one direction, and just down the road and across the street is another bus stop if I need to go in the other direction. The buses not only come every couple of minutes, but there is an app that I just plug in the place I want to go and it gives me the correct bus numbers as well as the number of minutes until it arrives at my bus stop. The buses are clean and generally not too crowded. The kids just love the bus. We all have cards that we refill with money at the MRT station (more on that in a minute) and we swipe it when we get on and off. The picture above is from today, riding one of the double deckers. We got the awesome front seats and I have to say, it was really fun! It's a great way to see the sights and get familiarized with the areas. Lastly, the bus is CHEAP. The kids and I rode many times the first week, and all we had on our cards was $7.00 each. It costs Jason about $2.00 a day to go back and forth from work (he rides two buses and one subway) - a taxi would probably cost $20 each way. Another mode of transportation that we frequently use, although not as much as the bus, is the MRT. I can get on the bus, go three stops and am dropped off at the MRT station in Holland Village. From there I can easily go almost anywhere on the island. For example, when the kids start school, I will have to go about four stops on one line, transfer trains and go just one stop. The school is located at the entrance to that MRT station. Not too bad! Cooper thinks he's really funny when on the MRT. He refuses to sit down, and either entertains or annoys the passengers. Hoping for more of the former. Finally, the taxi system is pretty much ubiquitous in Singapore. Like the buses, there are super convenient apps that you can use to order a taxi. Just open your app, call the taxi with about two screen touches, and not only have you ordered your taxi, you are informed how many minutes until it arrives AND you can watch the location of it on a map as it drives. Crazy, right? Here is the completely nutty thing about taxis though. Maybe because the price of a car here is astronomical and they are fearful of an accident, the drivers will not drive in the rain. They literally pull over somewhere and don't drive until it stops (hopefully this is not true if you're already in the cab!) So during rainstorms it is almost impossible to get one. Sometimes it is just not convenient to use public transport to a particular location, or we're just feeling a little lazy, but for the most part we try our hardest to resist calling a taxi. The picture above is from a cab ride home from the zoo. He was hilarious and so friendly - LOVED horse racing and was excitedly giving us tips for an upcoming race. Chatted with the kids etc. Not all of them are like that of course, but overall I've had good experiences. So all in all, getting around is much easier than I imagined it would be. I hope you didn't fall asleep reading this...it's just my day-to-day life and I wanted to document it! Lastly, I have to comment on something. I am willing to bet everything I have that there will never be a Biggest Loser contestant from Singapore. There are almost NO obese people in this country. It's unfortunate for me, but I probably land in the top 10% of heaviest people here. No, I'm not insulting myself. I'm accounting for my height too :-) But I'm not kidding. Most people are not just average, they are SKINNY. And this is a country known for being a foodie heaven. They eat a lot, and eat out a lot! I don't know if it's the walking or the portions they are eating, but take note, USA. They're making you look really bad. 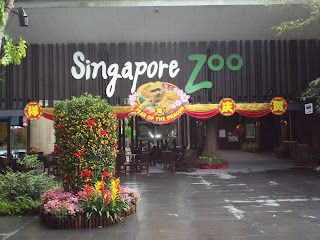 Next time - all about the Singapore Zoo. I read that it is one of the top ten zoos in the world, and it deserves the accolade. We're here! And just so happy to be a "whole" family settling into our new home together. 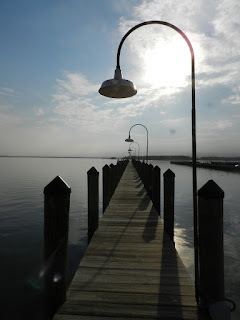 With the exception of bad traffic due to a car accident on the Verrazano Bridge causing us (okay, just Jason) to think we were going to miss our flight, the trip from Greenville, Delaware, to Singapore was totally uneventful. The kids were angels on the plane, with Cooper even proclaiming "this is the easiest thing I've ever done!" I'm going to brag about the kids now, because I think they deserve every single word of praise and I hope they read this as adults someday. We didn't even hear a "when are we going to be there?" in the 24 total hours we were traveling. I wasn't shocked, but I was still amazed at their complete and utter composure and pleasantness. Thank you Sophia and Cooper...you are unbelievable. We arrived at about 6:30am, and true to form, our luggage (all eight pieces of it) was awaiting us before we even got through customs (about 15 minutes). Take that JFK...you made us wait almost AN HOUR last time. We ordered a very large cab and was speeding our way to our new abode less than five minutes later. The kids loved the apartment, and of course we were at the pool as soon as we could find bathing suits in the mess that was my packing. The best thing about the pool is the depth - about 10 feet at the deep end (I need to learn the metric system, how many feet in a meter?) Sophia loves to dive and it's so rare in the US to find pools that allow diving (lawsuits anyone?). Needless to say, my two little frogs were in heaven. Later that morning, we took a taxi to Holland Village (the little town just down the road from our apartment) and looked for somewhere to have lunch. Because it was before noon, nothing much was open so we went to the grocery store (called Cold Storage) and picked up a few things and returned to the apartment. Okay people, a lot of you already know how pricey this little country is....well here is an example. I (unknowingly) paid almost ELEVEN dollars for a few tomatoes on a vine. I will definitely be frequenting the wet market (kind of like a farmer's market) for produce from now on...I have officially learned my lesson. But it's really hard to believe how much things cost. Twice as much as the US, sometimes more. Later that day, after we all had napped for seven hours, we let the kids go swimming again. This time, we met a couple, Mark and Lou(isa?) from New Zealand. Lots of "kiwis" here at our complex! They have two very young children, and like everyone but us, a live-in helper. Of course, the kids went gecko searching and Sophia "petted" the large snails affixed to the outer apartment walls. After that, since we were all so awake, we ventured to a delightful area, walkable from our apartment, called Dempsey Hill. It was late at night, but the kids still were excited to see a huge cage full of parrots, one of which had obviously perfected the whole mimic thing. The five-foot koi was also a hit. Since everything was closing soon, we had one drink at the Red Dot Brewery and headed home. A few more hours of TV and reading, and we were all fast asleep, hoping our bodies would get with the program the next day. Somehow, we were all up at a totally normal time on Wednesday morning, and we were at the pool by 10am. After about 100 dives by Sophia, we got dressed and headed to Clarke Quay (pronounced "key", after an embarrassing several times of calling it "Kway" on our last trip) for lunch. The kids loved the bus ride there (that's them flagging down the double decker!) and the MRT (subway) ride home. They were fully engaged every minute of the day and weren't intimidated in the very crowded malls on our search for flippers for the pool (didn't find them). When we got home, Sophia was totally focused on going to the pool when the school kids got home so she could meet people. Poor thing was completely disappointed when a thunderstorm rolled through. It lasted for a couple of hours, and just when I was ready to relax for the night, both kids were begging to go to the pool (Jason was asleep). Turned out, there was a delayed swim lesson going on and she met a friend, I talked to the instructor and signed them up for lessons (something to do!) and Jason and I met her new friend's parents (from Denver!). All in all, another good day. I'm not naive, I know it won't be perfect and I will have good days and bad days....but so far, I'm not complaining! And look at that crazy pink sky!